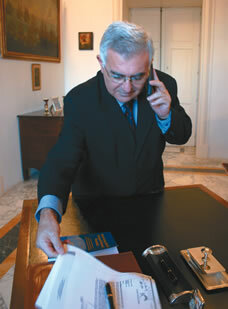 A week after being appointed consultant to the Prime Minister, former Cabinet Minister John Dalli is in defiant mode. Three years ago Dalli’s parting shot in his resignation letter alluded to a backstabbing from within the party itself. But Dalli avoids making any judgements on events leading to his resignation in 2004. Does he feel comfortable working so close to the man who never gave him a clear explanation why he couldn&apos;t have him in his Cabinet? “I feel comfortable working with a leader who was democratically elected to lead by the people I am committed to serve,” Dalli replies, alluding to his defeat in a bitter leadership with Lawrence Gonzi in 2004. During last week’s press conference, Gonzi argued that Dalli had been left “hanging” by the unfinished Auditor General’s audit into the procurement of airline tickets. The allegations revolved around a Lm40,000 purchase of airline tickets for Dalli’s foreign ministry from Tourist Resources Ltd. Yet it later turned out that the Auditor General’s investigation was not into Dalli’s ticket purchasing, but rather a probe into the ticket purchasing practices of every Ministry. Dalli himself declared that the airline tickets report was merely an “excuse” to prolong his political exile and that the real reason which led to his “forced resignation” was the fabricated Joe Zahra report on alleged kickbacks received for a medical equipment tender at Mater Dei Hospital. John Dalli is still convinced that the Joe Zahra report was the real reason why he was asked to resign. But isn’t his appointment as consultant on the eve of the general election merely a symbolic one? How can Dalli to make an impact on economic policy when all major decisions have been taken in the budget? “You are going on the mistaken assumption that decisions are to be taken to accommodate the politician between elections. I never acted by this belief. Decisions should be taken for their long term, rather than their short term effect,” he replies. He also points out that he was not appointed to assist in the resolution of any crisis, because there is no crisis. But his appointment falls short of a ministerial comeback. Is it not a case of “too little, too late”? Referring to Dalli’s recent appointment, Opposition leader Alfred Sant said that it reminded him “of the rehabilitation of prisoners sent to a Gulag.” But Dalli would not accept any words of sympathy from the Opposition leader. Over the past three years after his resignation, Dalli has been very critical of the party&apos;s administration. He criticised the party’s withdrawal from the Zejtun and Marsa election in 2005. He also criticised the treatment meted to the party’s grassroots activists. Was this appointment a way to silence him before the election? On Monday, Lino Spiteri compared John Dalli to a live albatross around Dr Gonzi&apos;s neck. “In clearing him, the Prime Minister did the fair and correct thing. But he also removed the albatross and the harm it could do not only up to the general election but also afterwards, particularly should the Nationalist Party be defeated," wrote the former labour finance minister. While agreeing with Spiteri that the Prime Minister did the right thing, Dalli rejects Spiteri’s symbolism. As the new economic consultant of the Prime Minister, what is Dalli’s opinion on the price stability agreements and does he see a risk of the cost of living spiralling out of control in March? On One TV the PM was recently confronted by a clip by Michael Woods – the brother of a Nationalist activist who was allegedly involved in a racket on invalidity pensions – who stated that anyone who backed John Dalli in the leadership contest was excluded. Does Dalli agree with Woods? Dalli promises that he will continue to work to ensure that all those who can contribute will be given the opportunity to do so. 2008 will see the end of subsidies for the shipyards. Dalli foresees a future for the shipyards noting that the shipping industry today has experienced an enormous boom. According to him, as demand by the new economies increases, demand for shipping will also increase and so will the freight rates. This time round Dalli will also be contesting the 10th district: a completely different reality from his sixth district Qormi constituency. But for Dalli, this is not the first time that is contesting new territory. On that occasion Dalli failed to get elected from the Cottonera district, but still managed to garner 1,539 votes. How can the PN still be relevant after 18 years in power? For Dalli it is ridiculous to measure relevance by the number of years a party has been in government, and points out that the PN has not been uninterruptedly in power for 18 years but has served two terms of nine years separated by a a short legislature stint by Labour. But he also singles out Labour leader Alfred Sant as a reason why Labour should not be elected. “Are you suggesting that we consider relevant someone who was not capable of completing his term in office or who has been consistently wrong in his policies? Will he get his policies right if he is in power? Or will it mean the destruction of this country?” Dalli asks. But considering the widespread perception that the same ministers have been governing the country for too many years, was it wise for Prime Minister Gonzi not to do a reshuffle before going to the next election? Dalli has recently praised French President Nicholas Sarkozy for his courage to push reforms in the face of trade union opposition. But Dalli also expresses mixed feelings on Sarkozy. Ironically in Malta the MLP is proposing one of the measures advocated by Sarkozy – removing taxes in overtime – what does Dalli make of this? “Removing tax from overtime is a ridiculous proposal, whoever proposes it,” the former Finance Minister replies. Surely Dalli would spare no favour for the Labour opposition as he seeks re-election to parliament: an improbable feat, at least until that Thursday morning when his integrity was certified by the same Prime Minister who had left him in the political wilderness for three whole years.